Penguins are one of about 40 species of flightless birds. Other flightless birds include rheas, cassowaries, kiwis, ostriches, and emus. Most flightless birds live in the Southern Hemisphere. Most scientists agree that there are 17 species of penguins. Of the 17 species, 13 are either threatened or endangered, with some on the brink of extinction. The Erect-crested Penguin (Eudyptes sclateri) has lost approximately 70% of tis population over the last 20 years. The Galapagos Penguin (Spheniscus mendiculus) has lost over 50% since the 1970s, and their chance of becoming extinct this century is 30%. The most common threats to all penguin survival are pollution, loss of habitat by human encroachment, commercial fishing, oil dumping, algae booms, and global warming. Generally, penguins are not sexually dimorphic, meaning male and female penguins look alike. Penguins often slide on their tummies over ice and snow. This is called tobogganing. Researchers believe they do this for fun and as an efficient way to travel. The Magellanic Penguin (Spheniscus magellanicus) is named after Ferdinand Magellan, who first saw them in 1520. Oil spills kill approximately 20,000 adult and 22,000 juvenile Magellanic Penguins off the coast of Argentina every year. Penguins find all their food in the sea and are carnivores. They eat mostly fish and squid. They also eat crustaceans, such as crabs, shrimp, and krill. A large penguin can collect up to 30 fish in one dive. Penguins (and any animal) that eat only fish are called piscivorous. Penguins do not have teeth. Instead they use their beak to grab and hold wiggling prey. They have spines on the roof of their beak to help them get a good grip. Penguins even have spines on their tongues. Penguins swallow pebbles and stones as well as their food. Scientists believe that the stones may help grind up and digest their food. The stones may also add enough extra weight to help penguins dive deeper. Penguins spend several hours a day preening or caring for their feathers. If penguins don’t keep them well maintained, their feathers would not stay waterproof. For extra protection, penguins spread oil on their feathers. The oil comes from a special gland near their tail feathers. Penguins molt, or lose their feathers, once a year. They always molt on land or ice and until they grow new waterproof coats, they are unable to go into the water. Molting may take weeks, and most penguins lose about half their body weight during this time. All penguins live in the Southern Hemisphere, from Antarctica to the warmer waters of the Galapagos Islands near the equator. They can be found on every continent in the Southern Hemisphere. No penguins live at the North Pole. The penguin with the highest number of species is the Macaroni Penguin, with approximately 11,654,000 pairs. Penguin nesting areas are called “rookeries” and may contain thousands of pairs of birds. Each penguin has a distinct call, which allows individual penguins to find their mates and chicks even in the largest groups. Penguins are highly social birds. Even at sea, penguins usually swim and feed in groups. Some penguin colonies on Antarctica are huge and can contain 20 million or more penguins at various times during the year. Out of all the penguin and bird species, the Emperor Penguin (Aptenodytes forsteri) breeds in the coldest environment. Air temperatures may reach -40° F (-40° C) and wind speeds may reach 89 mph (144 km/hr). A penguin’s normal body temperature is approximately 100° F (38° C). Emperor Penguins are the fifth heaviest of all bird species, although an adult male will lose about 26 pounds while he waits for a penguin chick to hatch. Emperor Penguins have the longest uninterrupted incubation time of any bird at 64–67 days. Emperor Penguins have the widest variety of vocalizations of all penguins. Scientists believe this is because they have no fixed nest site and must rely on vocal calls alone to find their chicks and mate. Most penguin species breed during the spring and summer. Egg incubation varies from 1 month and 67 days, depending on the species. The Emperor Penguin is the only penguin that breeds during the Antarctic winter. Penguins can stay underwater for 10–15 minutes before coming to the surface to breathe. Penguins cannot breath underwater. Most penguins can swim 5–6 miles per hour, and some can have bursts of speed of up to 15 mph. They can walk between 1.7 mph and 2.4 mph. In 2012, scientists discovered that a primary reason penguins can swim so fast is that they have a special “bubble boost.” When penguins fluff their feathers, they release bubbles that reduce the density of the water around them. The bubbles act as lubrication that decreases water viscosity, similar to competitive swimsuits. Even though penguins spend much of their lives at sea, they all return to land to lay eggs. Emperor Penguins are the largest penguins in the world and stand up to 4 feet (1.2 m) high and weigh as much as 100 pounds (45.3 kg). King Penguins (Aptenodytes patagonicus) are second in size only to Emperors. A King is almost 3 feet tall and can weigh nearly 35 pounds. Kings don’t waddle the way most penguins do. Instead, they run fairly quickly on their feet. King Penguins can form nesting colonies of up to 10,000 penguins. Each penguin keeps it neighbor at an exact but close distance. Gentoo Penguins (Pygoscelis papua) can grow up to 30 inches tall and weigh up to 13 pounds. They are different than other penguins because they have a colorful orange bill, and no other penguin has such a big tail. Macaroni Penguins (Eudyptes chrysolophus) get their name from the long, orange, yellow, and black feathery crests above their eyes. They were named after “macaroni dandies,” whose hairstyle was fashionable in the 18th century. Little (a.k.a. Blue or Fairy) Penguins (Eudyptula minor) are the smallest of all the penguins. They stand 16 inches high and weigh just 2 pounds. They live in the warmer waters around Australia, Tasmania, and New Zealand. Penguins’ eyes work better under water than they do in air. Many scientists believe penguins are extremely short-sighted on land. Yellow-eyed Penguins (Megadyptes antipodes), the third-largest penguins, have yellow cat-like eyes. They live along the coastal shores of New Zealand and neighboring islands. Penguins that live in and around Antarctica tend to survive in large numbers. Penguins that live in more temperate climates are more likely to suffer population declines. 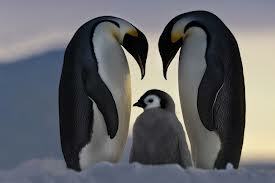 Only two species, the Adélie (Pygoscelis adeliae) and the Emperor Penguins, live on the frozen land of Antarctica. Most penguins live farther north, in New Zealand or along the coast of South America. The Galapagos Penguin lives farther north than any other penguin and is the only penguin that might venture into the Northern Hemisphere. To keep from overheating, penguins pant like dogs to cool off. They also ruffle their feathers and hold their wings away from their bodies. Penguins’ unique coloring is called countershading. To predators looking down from above, the penguins’ black backs help them blend into the dark ocean. To predators looking up from underwater, the penguin’s white belly blends in against the light sky and snow. Different penguins species have different ways of attracting a mate. King Penguins, for example, sing long songs with their partners. Gentoo Penguin males give their mates gifts of small pebbles or stones. For penguins, bonding is an important part of raising a chick. When penguin chicks hatch, they are not waterproof, so they must stay out of the ocean. They depend on their parents to bring them food and to keep them warm until waterproof feather replace their fluffy down coats.